Recently, I’ve noticed more people are holding off on their dreams or they’re putting them on the back burner. They will say it’s their dream to bring in $50,000 a year with their business or that they want to be able to pay themselves $2,000 a month. The most commonly used phrase regarding dreams is that “I want to quit my job to pursue my dreams but I can’t afford to do so”. Here is the problem most people do not go through the process of breaking down their dreams, goals, vision by numbers. They just feel they are far off from achieving this or it will never happen. 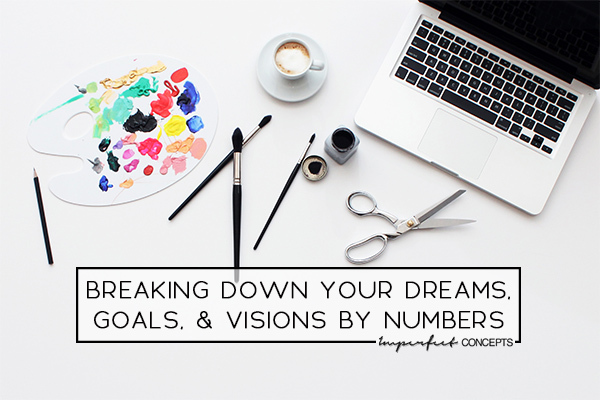 Today, I want to truly break it down by the numbers so you can see that you can live out your dreams, goals and visions. It all starts with a plan. Most small business owners and future business owners have a goal of making X amount a year; from revenue generated by their business. Almost two years ago, I sat down and asked myself how I could make six figures with my business. The first step was to get really specific. How can I make $120,000.00 in net income? This helped me focus on what needed to happen and what didn’t. I realized that I needed to bring in higher tiered consulting clients under the ICB Consults umbrella. The next step was to make sure I produced products every month; this is what my audience desired. That was done by introducing a minimum of 4 products a month consistently. So lets break the $50,000 net income! First lets use for the example that to run the company it cost $1,500 a month for this example. This includes hosting, website, graphics, legal and other expenses. That means your company has $18,000 a year in an expenses. Meaning your companies gross needs to be between $68-72,000 yearly. Also, remember taxes that you will pay and etc hence pushing to $72,000 gross. That is $6,000 a month in gross income. That is $193.54 each day based on a 31 day month. That is $200 each day based on a 30 day month. When you break the numbers down. You can see what you need to make on a daily basis to achieve your goal. Remember that $6,000 ties back to your goal of bringing in $50,000 net income. The next step is determining how your business will actually bring that in a month with sales. Most people are thinking about single transaction orders not multiple product order or even tiered pricing model. If I know that I need to make $200 a day to achieve my weekly goal of $1,400 sales goal I need to break it down by the transactions. You need multiple options based on your audience. With ICB Consults if I did one consult a day at my currently hourly rate of $375 I would make $1,875 on a 5 day work week. However, what is smarter is finding ways I can product passive income verse actually physical work. Hence why I created over 30 digital products. The average order on ICB Consults when it comes to digital products is $54 dollars. That means I need roughly 5 orders a day to achieve the $200 sales goal. Because you have to remember the fees paypal, stripe and other payment gateways charge. Looking at that it tells me I need an intermediate product that is between $54- and $375 so I can reach my sales goal. Now that I have given you various scenarios when it comes to achieving your goal of making x amount of money a month with your business. How can you sit down and determine how this can be possible in your business. You are going to start with your ultimate goal of making whatever amount a yearly net. Then you will determine what that looks like in gross income and finally break your numbers down my year – quarter- month – week and finally day.